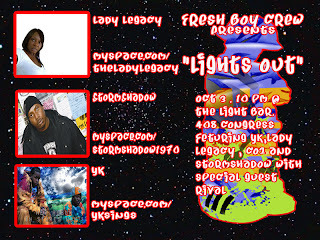 From the Royal Air Force GBU department... Stormshadow, Lady Legacy, and YK blowin' up Light Bar on Oct 3rd. From the Dude you're getting a Del department... Sharmane wrote in to tell us about the Del show, Thanks Sharmane!... Atleast once a year, Del tha Funkee Homosapien will roll through Austin... and we are that much better for it... Del tha Funkee Homosapien @ Emo's on Oct 3rd with a great lineup... Devin the Dude, The Coughee Brothaz, Bukue One and Knowbody. 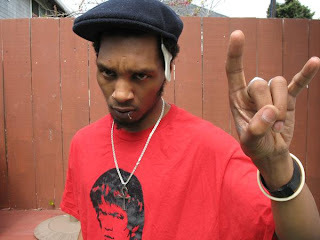 Del tha Funkee Homosapien, also known as Del the Funky Homosapien and Deltron Zero is an alternative hip hop artist. Del was born Teren Delvon Jones on August 12, 1972 in Oakland, California . Cousin of renowned rapper Ice Cube, Del began his career writing lyrics for Cube's backing band, Da Lench Mob . In 1991, with the help of cousin Ice Cube, Del released his first solo album, I Wish My Brother George Was Here . Although the album was a commercial success, it received mixed reviews from the hip-hop community. And ultimately Del, who was not pleased with the album himself, took matters into his own hands, and completely severed his relationship with cousin Ice Cube for his next album, No Need for Alarm. No Need for Alarm also saw the introduction of Del's crew Hieroglyphics . No Need for Alarm was a bold move on Del's part as it broke away from the model that had worked so successfully on his first album. Rather than the use of multiple P-Funk samples (like most hip-hop of the time), No Need for Alarm featured a more sophisticated, almost jazzy sound . No Need for Alarm was a commercial failure for Del, and it would be another five years before the release of his third album. About a month before the release of his third album Future Development Del received a letter from his label, Elektra, stating that his contract had been terminated . 1998 saw the release of Del's third solo album Future Development, the album was only available on the Hieroglyphics website for download, and in tape form in Japan. Future Development was re-released in 2002 under the Heiroglyphics Imperium label. Del also released another collaborative work with the Hieroglyphics crew in 1998, 3rd Eye Vision, it was the Hieroglyphics crew's first album. Two years later, Del released his fourth solo album, Both Sides of the Brain, as well as Deltron 3030 which was a collaborative work with artists Dan “the Automator” Nakamura and Kid Koala. 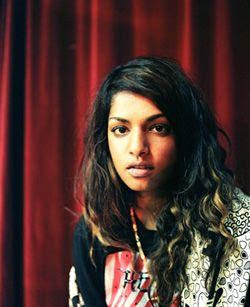 Exposure from the 3030 project helped to expand Del's fan base. The 3030 project was particularly interesting because the CD was a work of science fiction, telling stories about life and hip hop in the year 3030. 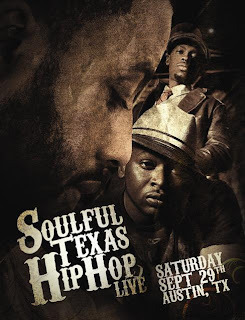 From the ya'll knew it was hot the first time department... Once again... Mojoe and Bavu Blakes for some Soulful Texas Hip Hop @ Club 115 on Sept 29th... entrance fee is a cool $10... it'll most definitely be packed so make sure you get there before 10pm! From the cummin' in ya face again department... 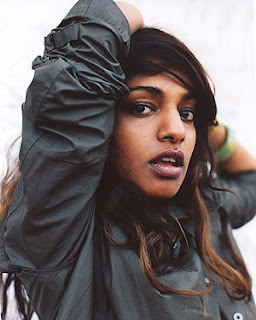 Thanks to Raul again... another M.I.A. show in Austin! First ACL and now at Hogg Auditorium on Nov 3rd! Tix go on sale tomorrow... get them here! From the acl fest hang over department... Thanks to Raul for letting us know about Method Man performing at the Texas Union on Sept. 26th. However, you will need to get your tix this Wednesday, Sept. 19th @ 8:00am SHARP! Wish I was a student again... can someone get me a ticket? Passes will be distributed at 8:00 am sharp on Wednesday, September 19th for Method Man which is taking place on Wednesday, September 26th at 8:00 pm in the Texas Union Ballroom. Come to the fourth floor of the Texas Union and be sure to have your Student or Staff I.D. You may receive up to 2 tickets per I.D., however YOU MAY NOT USE SOMEONE ELSE'S I.D. OR MULTIPLE I.Ds. These passes only guarantee you a place in line--admission is not guaranteed. Passes are free. Clifford Smith (born April 1, 1971), better known by his stage name Method Man, is an American rapper, record producer, actor, and member of the hip hop collective, Wu-Tang Clan. He has appeared in films and TV shows such as CSI, How High, The Wire, Garden State, and Soul Plane, among others. He took his stage name from the 1979 film The Fearless Young Boxer, also known as Method Man. 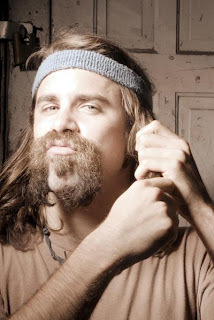 His name also refers to the slang "method", meaning marijuana in his native Staten Island. He is one half of the rap duo Method Man & Redman. Method Man was born in Hempstead, New York but moved back and forth between Staten Island and Hempstead during his teenage years because his parents got divorced. In an apparent precursor to his career in hip hop, he was introduced both to playing drums and to poetry by his father. Fans of Method Man often refer to him by the shorthand nickname "Meth"; the man himself has self-applied a variety of nicknames, the most common being variations of "Johnny Blaze." Not only was Meth interested in music, he was also fascinated by comic books and particularly Ghost Rider, a fascination which manifested itself years later in several of his many rap aliases. His pre-hip hop life was mostly split between drug dealing and low-paid jobs (including a stint working at the Statue Of Liberty, along with future Wu-Tang colleague U-God). He has often spoken out against the ways of his past and regrets having gotten involved in the world of dealing drugs. From the crazy rain department... Ziggy Marley @ ACL Fest this Sunday, Sept 16th. 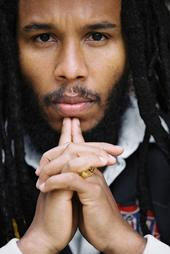 David Nesta "Ziggy" Marley (born October 17, 1968, Trenchtown) is a Grammy-winning Jamaican musician. He is the oldest son of Rita and Bob Marley1, the legendary roots reggae singer. His mother Rita called and baptised him David, but his father Bob nicknamed him "Ziggy" in reference to a marijuana cigarette. An alternative explanation links the nickname to the David Bowie persona "Ziggy Stardust" and his eponymous 1972 album. Born in Saint Ann Parish, Jamaica, Marley learned how to play guitar and drums from his father. From the got tight beats? department... Thanks to Sarah for peepin' us to Swizz Beatz @ Stubb's on Oct. 17... not much info yet... I'm sure more will leak through... for the time being you can get your tix here. It's awesome to see Stubb's getting more and more hip hop shows... it's a great venue for hip hop... great venue period. 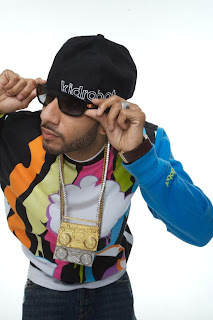 Kasseem Dean (born August 30, 1978) better known by his stage name Swizz Beatz, is a New York-based American hip hop record producer/rapper of African American descent. He is founder of the Full Surface Records music label. His songs are usually very "bouncy" and energetic, though his early work was known to be quite minimalistic and arguably experimental—it reportedly took him an average of only 10 to 15 minutes to complete a song. In most modern Swizz Beatz productions, (such as 'Top Down') the quick uttered phrase "Swizzy" is heard at the beginning and is accompanied by guest vocals from Swizz himself, although often uncredited. Swizz Beatz has his own production label called Full Surface and is currently working on albums by Mariah Carey, Madonna, Britney Spears, Jennifer Lopez, Cassidy, Usher, Papoose, Chamillionaire, Ja Rule, Busta Rhymes, Solange Knowles, Beyonce, Eve, Cassidy, 50 Cent,Ludacris, and Mary J. Blige. He is also set to be recording the new album for his close friend DMX which is confirmed to be titled The Resurrection Of Hip-Hop. 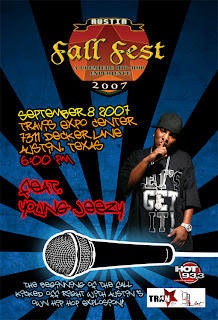 Swizz Beatz released his first solo album titled "One Man Band Man"
From the i luv it department... Coming to the Travis County Expo Center is the Fall Fest 2007 with Young Jeezy, Lil Keke, Lil Boosie with Webbie & Foxx, and Gorilla Zoe... show's this Saturday, Sept 8th... Get your tix here. Jay Jenkins was born in Columbia, South Carolina. As an infant Jenkins and his family relocated to Duncan Block, a neighborhood in Macon, Georgia (75 miles south of Atlanta). He eventually moved to West Atlanta's 4th Ward between late 1999 and early 2000. Jeezy has described his childhood as "empty". He has made innumerable references in his music to his previous occupation as a cocaine dealer, although he rarely provides details of his childhood in interviews. Also, according to his lyrics, which may or may not be factual, he has or had an uncle named Grady. This portion of his life, as is often the case with rappers, remains highly veiled and subject to much exaggeration in order to increase his street reputation. However, there is no doubt that Young Jeezy was involved at least to some degree in the illegal cocaine trade, and he is affiliated somehow with the slightly defunct Black Mafia Family. Young Jeezy has a 10 year old son who is often mentioned in his lyrics, along with his son's mother, who is not on good terms with Jeezy. He was arrested after an alleged shootout involving some of his friends in Miami Beach, Florida on Sunday, March 12, 2006. He was charged with two counts of carrying a concealed firearm without a permit, however, he was acquitted over lack of evidence. Though many people believed he is related to fellow rapper Yung Joc, he cleared the rumor up by telling the media that he is not related to the fellow Atlanta rapper, though they are friends. Both rappers are known for their slow, southern flow. After Hurricane Katrina, Young Jeezy opened his house to the victims in an effort to help them have a place to stay. In 2007, Young Jeezy released Cold Summer: The Authorized Mixtape, an album under rap group USDA which consists of Young Jeezy, Slick Pulla, and Blood Raw. So helping Boombox ring in the momentous night are The Handsomes and Pilaseca. Get your tix here. The result is Boombox. The 10-man band, featuring MC Overlord and MC Trey God, a brass section headed by Sosa called the GrooveLine Horns, a guitarist, bassist, drummer, DJ and keyboardist, played their first San Marcos show Thursday at Lucy’s San Marcos. Boombox has been playing Tuesday nights at the Lucky Lounge on 5th Street in Austin for the past three years, according to Sosa. Ross Tyler, an Austinite who frequents their shows, said the band packs Lucky Lounge. 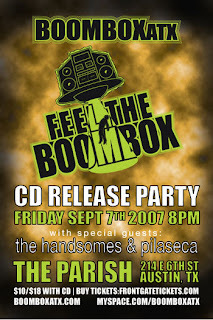 MC Overlord, or Donnell Robinson, said Boombox is all about producing great music and bringing hip hop back to basics.